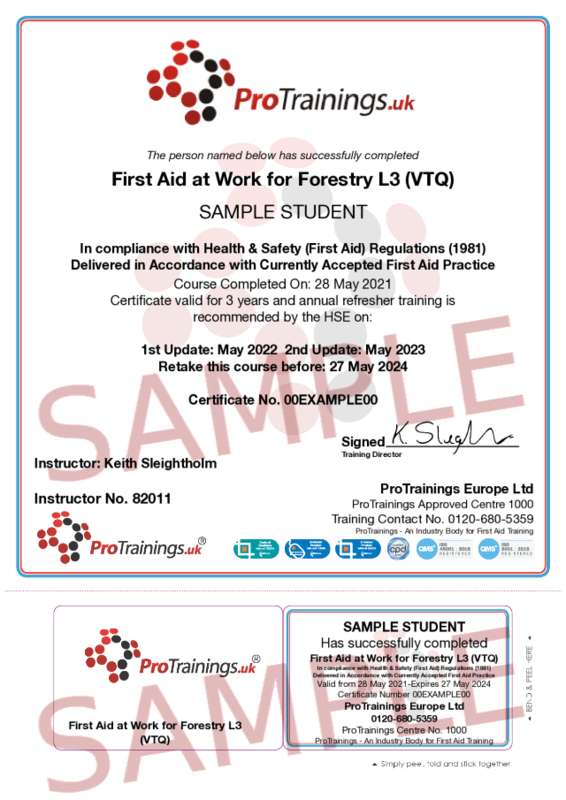 The Level 3 Forestry First Aid at Work BLENDED is ideal for most businesses whose risk assessment has identified that they require a fully trained first aider for their workplace. All courses are delivered, evaluated and quality assured to meet the new guidelines set out by the HSE in October 2013 and meet the requirements of the First Aid at Work (First Aid) regulations 1981 and subsequent 2016 changes. Also included to comply with the latest HSE and ERC guidelines, are Tourniquets and Haemostatic dressings. All our first aid courses fully meet the UK and European Resuscitation Council Guidelines 2015 as per the HSE requirements. This course must be at least 18 contact hours and run over a minimum of 3 day and the certificate is valid for 3 years. To renew you need to attend a 12 contact hour 2 day FAW-F requalification course. In May 2016 the HSE and Awarding Organisations announced that computer based blended training is now allowed for all workplace first aid courses. You can now become a fully qualified First Aider in the workplace, with two days of classroom training after completing this online course. Reduce your training and travel costs by using our engaging, blended online video based course. Learn at your pace, one to one with your instructor at a time that suits you. This blended FAW course meets all of the requirements under the HSE and Awarding Organisations and is available as a ProTrainings or Regulated Qualification. A modern approach to training backed up by years of experience providing online, blended and classroom courses. Clear, concise and engaging, when you choose ProTrainings you reduce the cost, not the quality of your training. Please be advised that the classroom course has a minimum age requirement of 16.This is the classroom-only part 2 of a 2-part blended course. Before taking this course, you MUST complete the online course. 1 Understand the role and responsibilities of a first aider. 1.1 Identify the role and responsibilities of a first aider. 1.2 Describe how to minimise the risk of infection to self and others. 1.3 Identify the need for establishing consent to provide first aid. 1.4 Complete an accident report form. 1.5 Identify the first aid equipment that should be available in a workplace. 1.6 Describe the safe use of first aid equipment. 2 Be able to assess an incident. 2.1 Conduct a scene survey. 2.2 Conduct a primary survey of a casualty. 2.3 Give examples of when to call for help. 3 Be able to manage an unresponsive casualty who is breathing normally. 3.1 Assess a casualty’s level of consciousness. 3.2 Open a casualty’s airway and check breathing. 3.3 Explain why it is important to place an unconscious casualty into the recovery position. 3.4 Place an unresponsive casualty in the recovery position. 3.5 Manage a casualty who is in seizure. 4 Be able to manage an unresponsive casualty who is not breathing normally. 4.1 Recognise the need to commence Cardio Pulmonary Resuscitation. 4.2 Demonstrate Cardio Pulmonary Resuscitation using a manikin. 5 Be able to recognise and assist a casualty who is choking. 5.2 Administer first aid to a casualty who is choking. 6 Be able to manage a casualty with external bleeding. 6.1 Identify the types of external bleeding. 7 Be able to manage a casualty who is in shock. 7.2 Administer first aid to a casualty who is in shock. 8 Be able to manage a casualty with a minor injury. 8.1 Administer first aid to a casualty with small cuts, grazes and bruises. 8.2 Administer first aid to a casualty with minor burns and scalds. 1 Be able to conduct a secondary survey. 1.1 Identify the information to be collected when gathering a casualty history. 1.2 Conduct a head to toe survey. 2 Be able to administer first aid to a casualty with injuries to bones, muscles and joints. 3 Be able to administer First Aid to a casualty with suspected head and spinal injuries. 4 Be able to administer First Aid to a casualty with suspected chest injuries. 4.1 Recognise the different types of chest injury. 4.2 Administer first aid for a chest injury. 5 Be able to administer First Aid to a casualty with burns and scalds. 5.1 Recognise the factors that affect the severity of burns and scalds. 6 Be able to administer First Aid to a casualty with an eye injury. 6.1 Give examples of common eye injuries. 7 Be able to adminster First Aid to a casualty with sudden poisoning. 7.1 Identify the routes that poisons can take to enter the body. 7.2 Administer immediate first aid to a casualty affected by sudden poisoning. 7.3 Identify sources of information for treating those affected by sudden poisoning. 8 Be able to administer First Aid to a casualty with anaphylaxis. 8.1 Identify common triggers for anaphylaxis. 8.3 Administer immediate first aid for a casualty suffering from anaphylaxis. 9 Be able to provide First Aid to a casualty with suspected major illness.